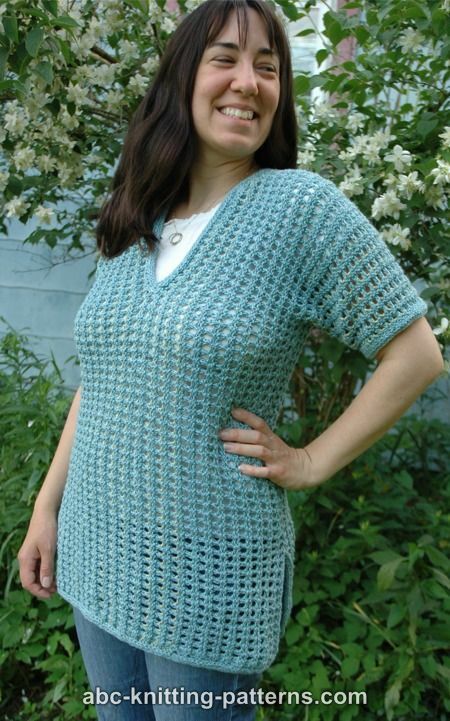 The remarkable thing about this summer sweater is the mesh pattern that I chose. 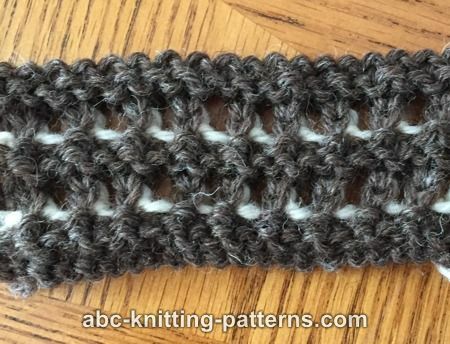 It resembles filet crochet, even though it is knitted, and it's very easy to work. However, the special thing about it is that it's actually two-color. The second color is mostly covered by the first color, so you get only glimpses of it as you move around. This is why I called it the "subtle sweater". 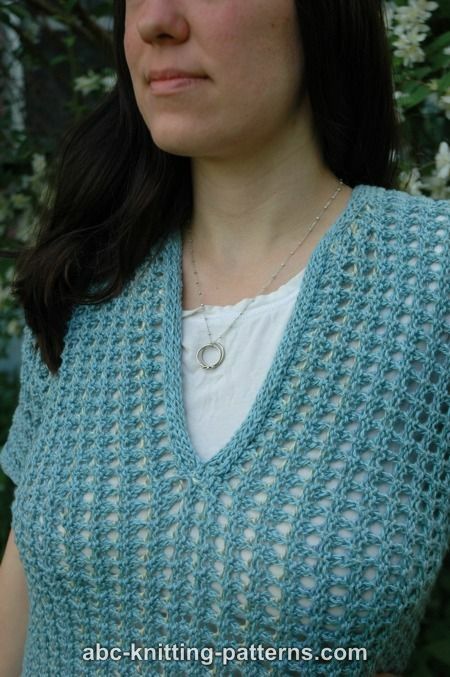 For the sweater I made, I chose similar colors to enhance the effect. You can also use contrasting colors (see swatch in brown and white below). 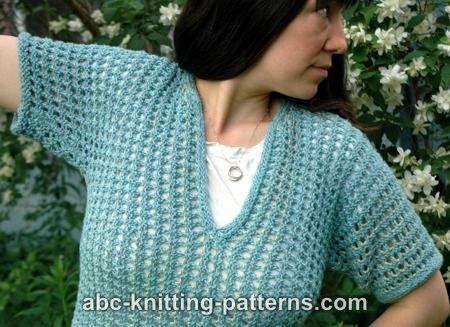 The sweater is worked sideways, cuff-to-cuff, and features side seams. The neckline, sweater hem, including side slits, and cuffs are finished with applied I-cord. Row 4: *k 1, sl 1 wyif, repeat from * to last 2 sts, k 2. Row 5: k 1, * yo, k2tog, repeat from * to last st, k 1. 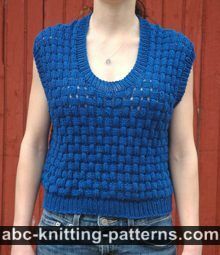 The sweater is knitted in a mesh stitch back and forth, sideways (cuff-to-cuff) as one piece, starting from the left sleeve, then the body of the sweater, then the right sleeve. There are side-to-sleeve seams. 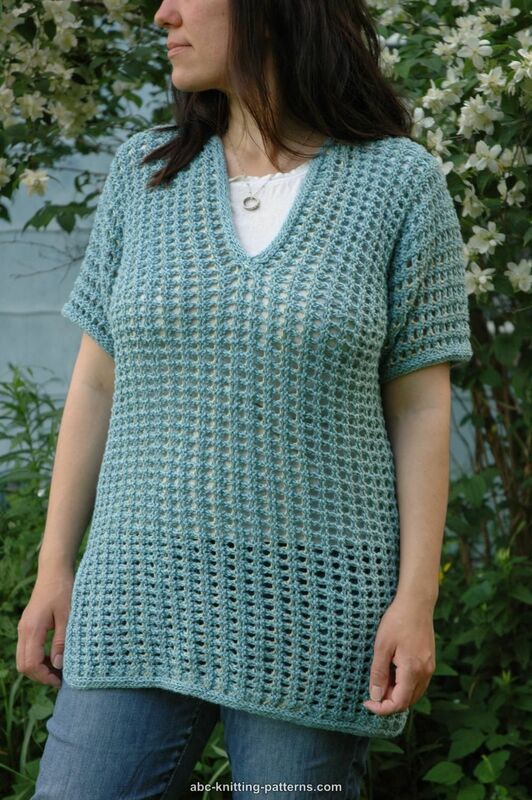 The sweater is finished with applied I-cord. 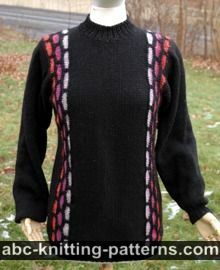 The sweater has short 5” (12 cm) sleeves. 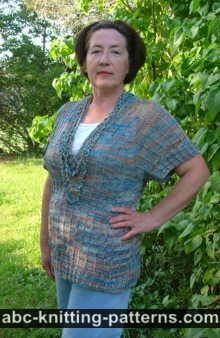 If you would like to change the length of the sleeves, work more of less rows for each sleeve. 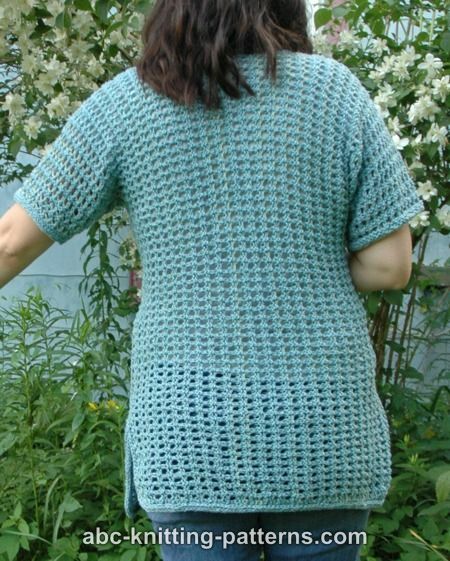 If you would like to change the length of the sweater, cast on more or less sts as instructed at the beginning of the Body section. 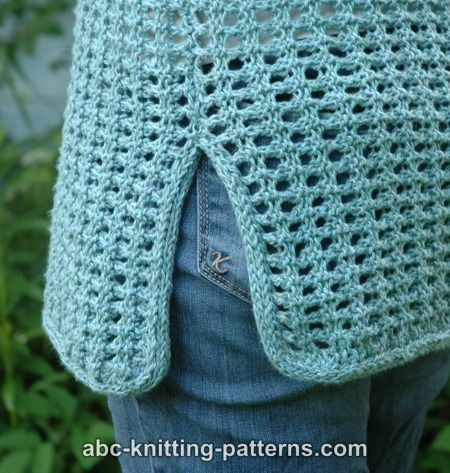 Cast on 50 (58, 66, 70, 74) sts (there are 2 selvedge sts included) and work mesh pattern (see above). Row 37: at the end of this row cast on 70 (71, 72, 72, 72) sts. At the end of the next row, cast on the same amount of sts. These are body stitches, which form the front and the back. 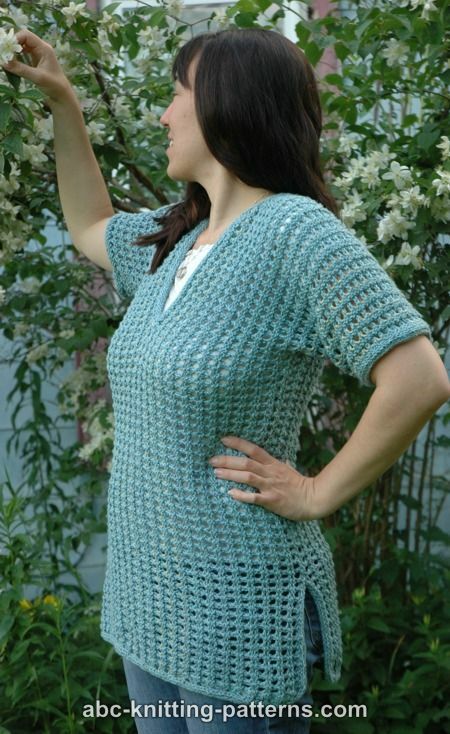 If you would like a longer jacket, you need to cast on more stitches (the same amount for front and for back). Total stitch count is now 210 (216, 222, 224, 228). Work 52 (58, 64, 70, 76) rows. This is the left shoulder rows. Work first 105 (108, 111, 112, 114) sts of RS row. Transfer the rest of the stitches to another circular needle. Continue to work the back stitches only. Decrease by 1 st in every RS row 4 (4, 6, 6, 6) times by working k2tog (2 sts before the selvedge st) at the end of the row. Total 8 (8, 14, 14, 14) rows. Work 20 (24, 14, 14, 18) more rows. Increase by 1 st in every RS row 4 (4, 6, 6, 6) times by working m1 at the end of the row. Total 8 (8, 14, 14, 14) rows. Set aside. Work the sts that were transferred to an additional needle. Transfer the stitches to the working needle and bind off 7 (7, 7, 9, 9) sts at the beginning of the row. Decrease by 1 st in every RS row 5 (5, 7, 7, 7) times by working ssk (2 sts after the selvedge st) at the beginning of the row. Total 10 (10, 14, 14, 14) rows. Work 6 (8, 4, 4, 6) rows. Bind off 30 sts at the beginning of the row for the front opening. Work 6 more rows. At the end of the 6th row cast on 30 sts. Increase by 1 st in every RS row 5 (5, 7, 7, 7) times by working m1 at the beginning of the row. Total 10 (10, 14, 14, 14) rows. At the end of the last row cast on 7 (7, 7, 9, 9) sts. Continue to work back and front again. Work RS row starting from back, then continue over the cast on sts of the right neck and then front sts. The stitch count should be 210 (216, 222, 224, 228) sts again. Work 52 (58, 64, 70, 76) rows. This is the right shoulder rows. Work next RS row. Bind off 70 (71, 72, 72, 72) sts at the beginning of the next row. Work to the end of the row. Turn. Bind off 70 (71, 72, 72, 72) sts at the beginning of the row. Work to the end of the row. This is the 1st sleeve row. Total after the decreases 50 (58, 66, 70, 74) sts. Sew sleeve and side seams, leaving 6” (15 cm) at the bottom unsown for the side slits. Work applied I-cord along the bottom of the sweater and along the slit’s sides. Work applied I-cord along the front center and neckline, starting from the center of the back. Work applied I-cord along the bottom of the sleeves.